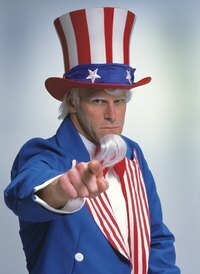 Legend says if you're a worthy American, the spirit of Uncle Sam will embody you in times of need. Be prepared for that moment by wearing your own Uncle Sam costume. An Uncle Sam costume can be created with ease and can be worn with a gray wig and adhesive goatee. Wear these costume pieces with a button-up white shirt, red bow tie and black shoes. Measure the tuxedo jacket lapels. Cut two pieces of red- and white-striped fabric to fit that measurement. Spray the jacket lapels with spray adhesive fabric glue. Carefully lay each section over the glued lapels. Work from one end of the fabric to the other and rub the fabric in place. Remove the decorative buttons on the outside of the tuxedo jacket. Sew a star-shaped button over the area where the original buttons were located. Lay the white trousers onto a flat surface. Place painter's tape vertically up each pant leg. Make sure that the painter's tape is positioned so there is a 1-inch gap between pieces of painter's tape. Paint the white space between the pieces of tape with red fabric paint. Work from the ankle of the pants upwards to the waist. Use even strokes and at least two coats of paint. Allow the fabric paint to dry before removing the tape. Hot glue white felt around an oatmeal container. Make sure to completely cover the sides. Cut away any extra fabric. Trace the bottom of the oatmeal container on a white piece of felt. Cut the felt circle from the fabric and set it aside. Add stripes up the sides of the oatmeal container. Cut a strip of 2-inch wide grosgrain ribbon so that it is long enough to fold inside the oatmeal container and over the opposite end of the container. Hot glue the ribbon to the outside of the container. Cut nine more pieces of ribbon and hot glue them around the hat. Hot glue the white circle piece of felt to the bottom of the oatmeal container. Trace the bottom of the oatmeal container onto red felt. Measure 3 inches outwards from the circle and draw another circle to create the hat brim section. Cut the circles out. You should now have a doughnut-like piece of felt. Insert the bottom of the oatmeal container through the center of the felt doughnut. Add hot glue around the edge where the felt and oatmeal container connect. Create a hatband. Measure around the oatmeal container. Cut a section of blue felt that is the same length as that measurement and is 4 inches high. Hot glue the hatband in place. Paint a white star in the center of the hatband. Paint additional stars around the hatband. Paint as many or as few as you’d like.